The art and science of palmistry, has an ancient heritage. It has been used by great Rishis in day to day life. In the last two centuries, great thinkers and researchers of western and Indian origin have studied it in great depth, and presented it before mankind. Man has always yearned to know in advance what his future will be like. He is eager to know his longevity, family life, career, and health in advance. A palmist is able to tell with good accuracy the incidences of a person's past life, and those that will occur therefrom. Forewarned is forearmed, goes a saying. So if one can get an idea of the dangers, and opportunities beforehand, why must one not take the benefit from it? This thinking has inspired the further investigation into the intricacies of palmistry. Medical science is also utilizing the knowledge of palmistry. 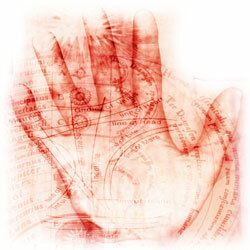 Disease can be diagnosed with the help of palmistry today! The ancient physicians had developed a method to diagnose diseases by studying the pulse. Be it man or woman, the palm which is more active is studied. If the person is a lefty, the left hand is studied. To know the personality of a person, the mounts of the various planets represented on the palm, along with the signs, are studied. You will see signs like triangles, circles, islands, stars, and cross, moles, squares and rectangles on the palm. These are of further importance. If the date , time or place of birth of a person is not known accurately, palmistry, is an excellent method to answer his questions.